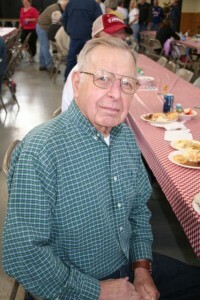 The last time I saw Ernie Speth was May 8, 2010, at a surprise 80th birthday party that his family and friends threw for him. Ernie was a Quad-Cities racing pioneer and Speedway Fire-Rescue honored him as such on Feb. 16, 2013, at its awards banquet in Davenport, Iowa. Sadly, he could not attend due to health issues, but some of his family members were present to accept a plaque on his behalf. Ernie died on March 5, 2013. Ernie Speth says it was 1949 when his older brother Ray raced a pleasure car, owned by their second cousin, Ronnie Weedon, in the first-ever race at the old Mahoney’s race track west of Davenport. The promoter, as Ernie recalls, was a Dubuque undertaker. But Ernie, who was 19, didn’t race that first season himself. He had other interests on his mind – namely girls. Ernie’s brother got him into racing the next season, 1950. But the stock car also remained his pleasure car. He drove it around town and back and forth to race tracks with its number on the sides. He’d take the headlights out to race and put them back in to drive home. Ernie’s next event was in Sterling, Ill., and he made the show this time. But he also flipped his car. Ernie’s dad and brother Ray also worked on cars but to a lesser extent. 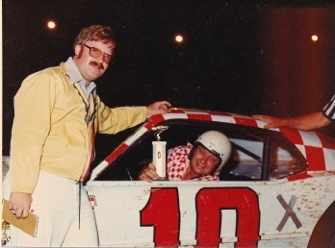 “Midgets were big then (at race tracks), but we didn’t have enough money for a Midget. (But) it was cheap to get a stock car,” says Ernie. Ernie raced until 1982. He says he only ran a couple of races that final season before hanging it up. He had been racing a Mustang but had taken that body off and put a Granada body on the chassis. Though Ernie raced a Ford in his final years in racing, from 1957 into the ’60s he was known for racing Studebakers. In fact, Studebakers were one of his trademarks for years. The other trademark were the red and white checkerboard roofs on his stock cars.